Tips for China - Is the IKEv2 protocol any good in China? Is the IKEv2 protocol any good in China? The answer is "it depends"... on the server. The iOS apps of many VPN services use the Cisco IKEv2 protocol. I have always found this protocol to perform very poorly during my testing and concluded that IKEv2 doesn't work very well in China. I was testing the new iOS app from VPN.ac yesterday and discovered that the IKEv2 protocol works extremely well - on one specific server. The Los Angeles server hosted on Psychz is very fast with the IKEv2 protocol. 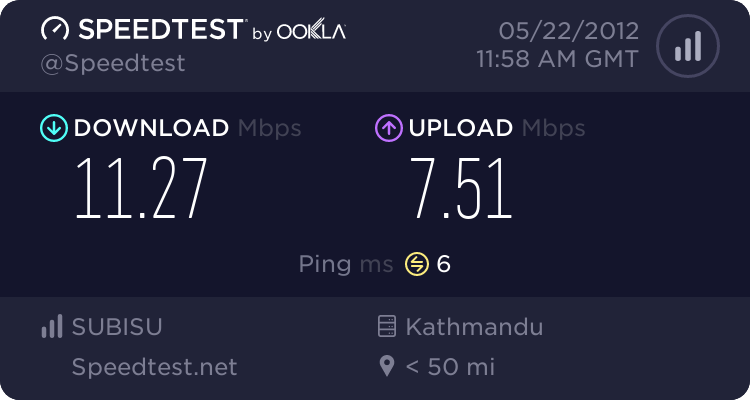 I was able to get 75M download speed on my China Telecom 100M fibre connection. The server names used by VPN.ac are very confusing. The Psychz hosted server is called "Los Angeles" in the iPad app but in the Windows software, it is called "Los Angeles 4" and "US West - CN2 Peer". On the server status page of the website with the host names, it is called "Los Angeles 3". Confused? So am I.
I tested this exact same server (same IP address) using the Windows software with OpenVPN, take a look at the speed below. I did a few more tests on the both the iPad and computer. The results were fairly consistent on both devices. I was getting between 60M - 80M on the iPad with IKEv2, sometimes slower but never less than 30M. On the computer, I tried OpenVPN TCP and UDP on several different ports, the speed was never higher than 1.5M. I also tried PPTP and L2TP but both failed to connect. It is obvious that China Telecom is specifically throttling OpenVPN traffic to that specific server. There is nothing unusual about that. What I find unusual is that it is normally the other way around, the IKEv2 traffic is throttled instead of OpenVPN. Next, I decided to compare some other servers using IKEv2 on the iPad vs OpenVPN on my computer. 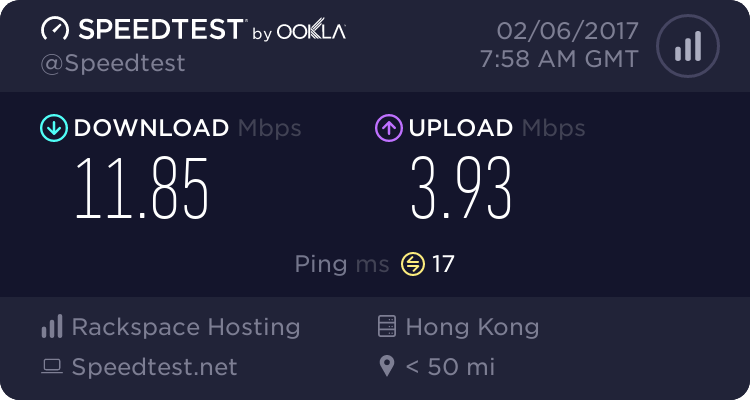 Next up is my second favorite low latency Asian server for connections from China Telecom - StrongVPN Hong Kong HKG302, hosted on Tele Asia. 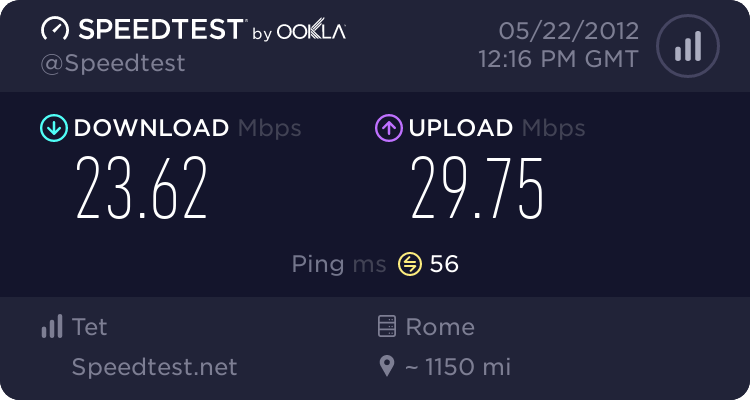 Here is the speed using OpenVPN on my computer. Got to love that 18ms ping time! Using the StrongVPN iOS app connecting by IKEv2, the speed is much slower. I will try another server from VPN.ac. 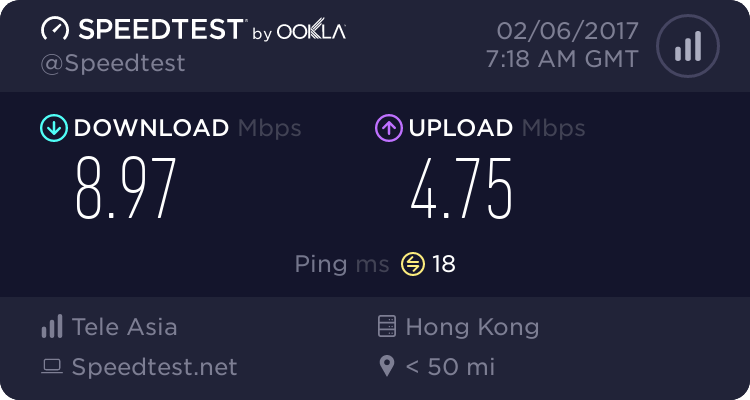 Here is the speed using OpenVPN on my computer for the Hong Kong 2 server. 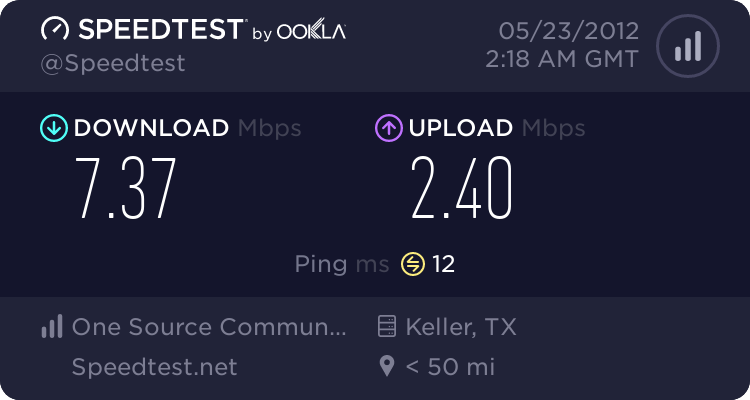 Again, the speed is much slower with IKEv2. 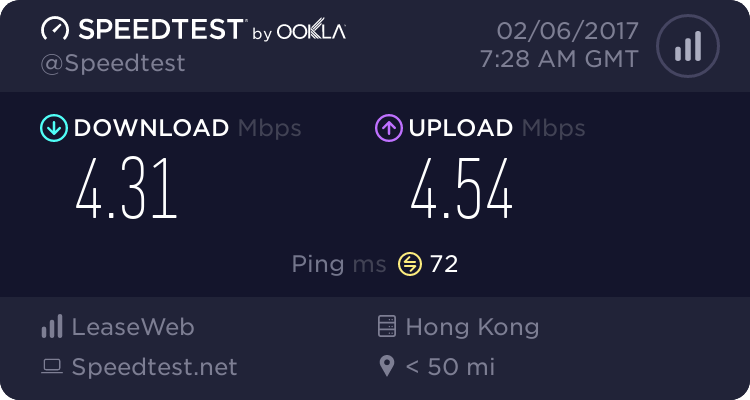 No test would be complete without testing my favorite low latency Asian server for connections from China Telecom - ExpressVPN Hong Kong 3. Their iOS uses OpenVPN and IPSec so I won't be able to test IKEv2. Actually, IPSec doesn't work with Hong Kong 3 so I can only compare OpenVPN on my computer to OpenVPN on the iOS app. I expect the results to be similar. ExpressVPN Hong Kong 3 OpenVPN on my computer. Using OpenVPN in the iOS app with the same server is obviously not significantly different. ExpressVPN is the only VPN provider I am aware of that is able to offer OpenVPN in their iOS app. I don't know how they got the approval from Apple, but it's a great accomplishment! The lesson from today's blog post is that you should always try all of the available protocols and options available to you when using a VPN in China. Some servers work better with OpenVPN UDP, other servers work better with OpenVPN TCP, and some might even work better with IKEv2. It all depends on the server! The IKEv2 protocol is also available for manual connections in Windows 7. I tried connecting to the VPN.ac Psychz hosted server (aka Los Angeles 4 aka US West - CN2 peer on Windows, aka Los Angeles on iOS). Unfortunately, I could not connect to that server using Windows although I was able to connect to other VPN.ac servers using IKEv2 on Windows. I have a sent a support ticket to VPN.ac regarding the connection failure of that server using PPTP, L2TP, and IKEv2 in Windows but still haven't heard back after almost 24 hours. That is one of the disadvantages of VPN.ac, the support is not 24/7 and sometimes the support tickets are not answered in a timely manner. Usually, I get fast replies if I open a ticket during working hours in Romania, but not always. I will post an update here when I get a reply. Hopefully, I will be able to test IKEv2 on Windows with that Psychz hosted server. I will also try to test some other VPN services and servers using IKEv2 on Windows. If you find anything good, I will post it on the VPN blog page. I haven't tried yet, but IKEv2 connections are possible on Android using the strongSwan VPN client. Among the servers tested in this blog post, I prefer to use ExpressVPN Hong Kong 3. The reason is the low latency (ping time). Most people only look at download speed and fail to consider latency when deciding what VPN server is best. Latency, or ping time, is the amount of time needed to send one packet of data to the server and back. You can think about it as the amount of time needed to initiate a connection before any data is sent. 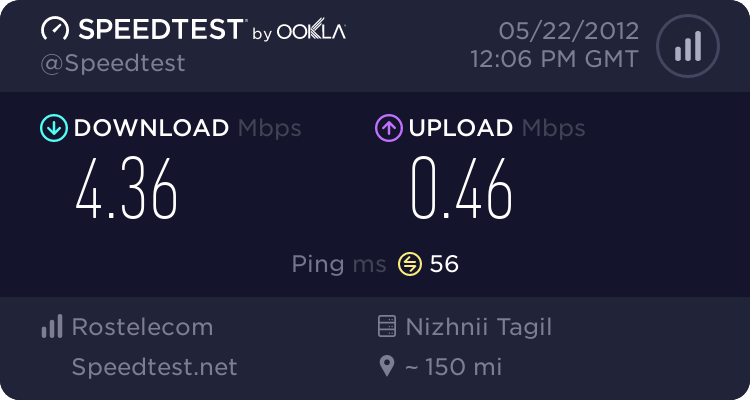 I always prefer low latency Asian servers with direct connections to China Telecom with latency under 20ms. You can always find an updated list of my favorite low latency Asian servers on the VPN in China blog page. Using these servers makes web browsing very fast, web pages load extremely quickly and videos play immediately after clicking them. Even 5M is enough to stream videos in 1080P HD. 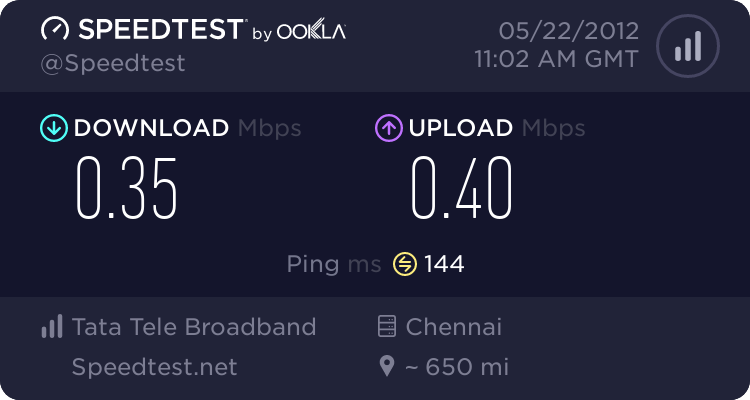 Unless I am downloading a large file or torrenting, I will always take low latency over high download speed. Some people think that everything is hosted in the USA so there is no point connecting to an Asian VPN server, but this is simply not true. Most websites are using a CDN service so that their content is loaded from a location close to the visitor. In the case of Google services (search, Gmail, YouTube, etc), they have servers in Asia so there is no need to connect to the USA. 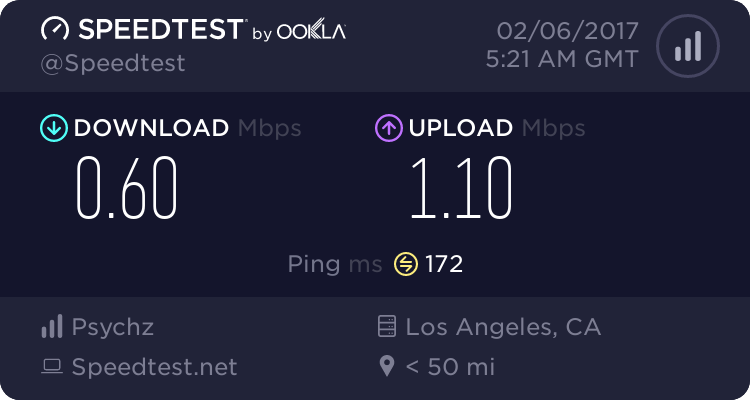 After finishing the download tests, I compared watching YouTube on the iPad with VPN.ac Los Angeles Psychz hosted server (latency 170ms, DL speed 75M) with ExpressVPN Hong Kong 3 (latency 17ms, DL speed 10M). Both servers had no problem playing videos in 1080P but with ExpressVPN Hong Kong 3, the videos loaded immediately, whereas it took a few seconds to load the video with VPN.ac. Having said that, VPN.ac is less than half the cost of ExpressVPN. If you are on a budget and don't care so much about high performance then VPN.ac is a better choice for you. 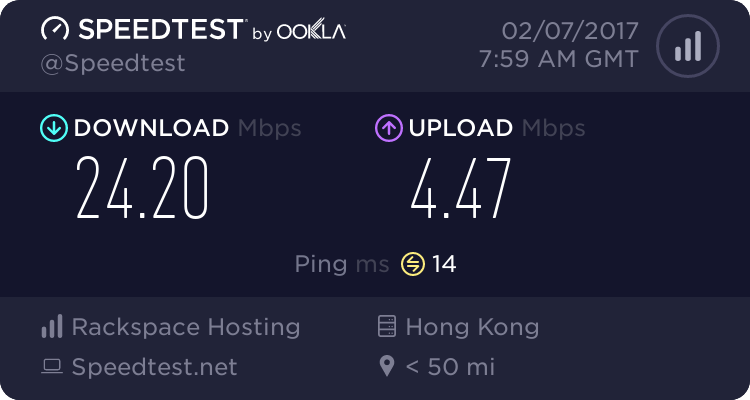 If you want the best of the best low latency from connections from China Telecom, then I highly recommend you try out ExpressVPN Hong Kong 3. Want to get the best discounts on these VPNs? If you are interested in trying any of the VPN services mentioned today, they are all available with a money back guarantee and I have great special discount offers for all of them. Have you found any VPN servers that perform good with IKEv2 in China? Leave your comments below! The following day, I tested the VPN.ac Psychz server again with IKEv2 on the iPad but it was much slower than yesterday. But still faster than the same server with OpenVPN on Windows. And now ExpressVPN Hong Kong 3 is faster than yesterday. Speeds can be unstable so you can't read too much into a single set of test results but there is definitely less throttling on IKEv2 for that one server of VPN.ac hosted on Psychz networks in Los Angeles.